Thymosin Alpha-1 is a component of Thymosin Fraction 5 responsible for restoring immune function in animals lacking thymus glands. It was the original peptide synthesized from the Thymosin Fraction 5. 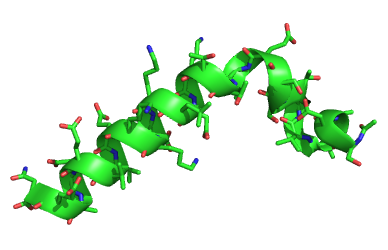 Unlike β thymosins, which are genetically and chemically unrelated, Thymosin α1 is produced as a 28-amino acid peptide fragment from a longer, 113-amino acid precursor,prothymosin alpha. Research has shown it to enhance cell-mediated immunity in experimental animals and research subjects..
Thymosin Alpha-1 is being researched for the treatment of Hepatitis B and C, and it is also approved for inclusion with vaccines to boost the immune response in the treatment of other diseases. Exhibiting a variety of immunoregulating properties, thymosin-alpha-1 induces differentiation of murine T-cell precursors and human thymocytes and the terminal differentiation of functionally immature cord blood lymphocytes and induces production of IL-2, high affinity IL-2 receptors, and B-cell growth factors by peripheral blood mononuclear cells. T-helper and cytotoxic/suppressor T-cell populations are targets of thymosin activity. Thymosin-alpha-1 has been shown to increase the efficiency of antigen presentation by macrophages and to be an endogenous modulator of alpha-thrombin activity.